There are many methods of converting CSV data into a database table format. One of the ways is to create a new table and copy all the data from the CSV file to the table. However, copy and pasting data can be extremely cumbersome and time-consuming if the dataset is very large. Another way is to write a script that reads the CSV data and inserts it into the corresponding data table. This method is faster than copy-pasting but it still requires a manual script. There is a better way to achieve this if you are lucky enough to use SQL Server. In SQL Server, you can simply import and convert CSV files into data tables with a few mouse clicks using SSMS (SQL Server Management Studio). In this article, we will see how we can import CSV data into SQL server using SSMS, convert it into data tables, and execute SQL queries on the tables that we generate. The file that we are going to import contains 178 records of wine information. The file can be downloaded from this Github repository. I have named the file “wine.csv”, you can give it any name. You can import a CSV file into a specific database. Let’s first create a dummy database named ‘Bar’ and try to import the CSV file into the Bar database. Now follow these steps to import CSV file into SQL Server Management Studio. This process is valid for all different types of flat files, however for the sake of this demonstration we will use a CSV file. Simply click the “Next” button. Simply close the CSV file and/or any other application that has access to the CSV file, go to the previous screen and click the “Next” button again to fix this. You can see that the preview contains data from our CSV file. Click the “Next” button. Furthermore, you can also set a column as the Primary key and allow Null values for any column. Once you are done with modifying the columns, click the “Next” button. We have successfully imported our CSV file to our SQL Server data table. We can now execute SQL queries on this table. Execute the following query to SELECT all the records from the newly created “wine” table. Similarly, we can filter records based on the value in one more column. Let’s filter all those records where “Phenols” has a value greater than 3.5. 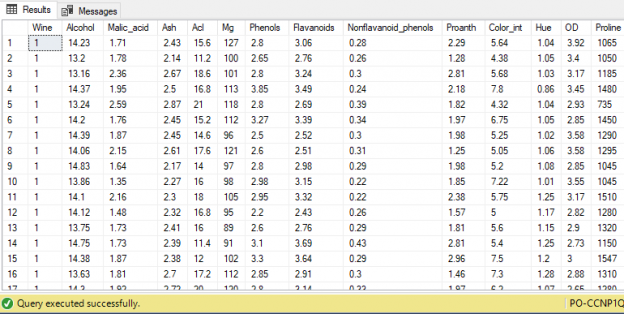 You can see that only those records are retrieved where the value of “Phenols” column is greater than 3.5. In short, you can perform all the operations on the imported “wine” table that you perform on any SQL table, which you create from scratch in SQL Server. CSV is a very common format, especially for machine learning and data science datasets. SQL Server can be used to preprocess CSV data more effectively than MS Excel. In this article, we saw how a CSV file can be imported into SQL Server via SSMS and how basic SQL operations can be performed on the table that is created as a result of importing the CSV file.